REINFORCING BARS - Surrey Steels - Steel fabricator and supplier in London. At Surrey Steels you can order ready-made reinforcing bars that are cut to size and bent accordingly. You can also buy steel in tonnes and cut it on the construction site. However, it’s important to calculate the amount of steel required for the project accurately. When purchasing steel for cutting on-site, it is best to buy the required amount of steel plus 10% to account for wastage. 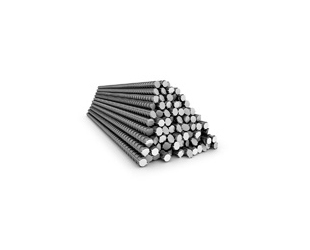 Reinforcing bars are delivered in bundles or in coils. Coils must be straightened before cutting and laying in the formwork, which is quite difficult to do on-site without the proper equipment. We recommend that it’s better to buy rods in bundles or ready, cut and bent in accordance with the designer.